This is a Great Value Christmas Bundle! 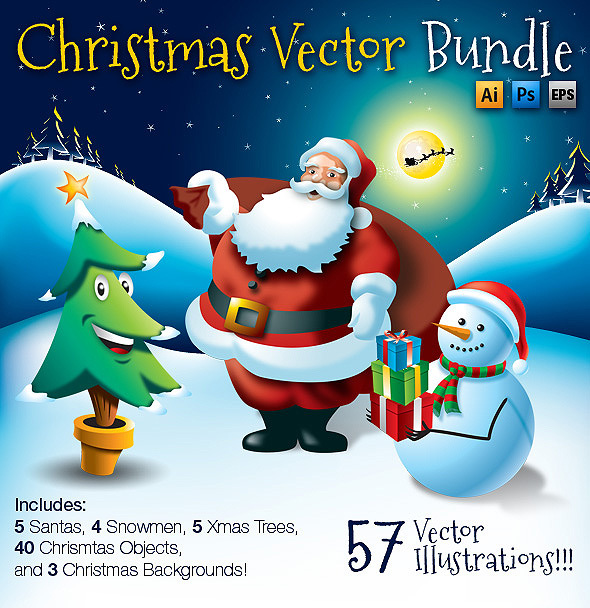 This combines 3 Christmas Vector items into one, which includes 57 High Quality Vector Illustrations. It’s a Huge money saver!!! The combine price of the items would be $22, but you can now buy it for $13 – That’s 40% off!!! 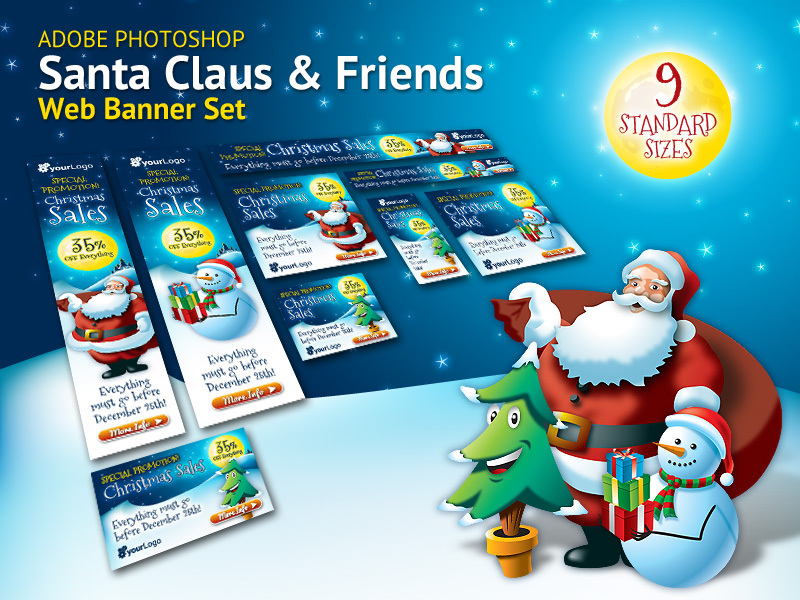 With this set is very Easy and Fun to create your own custom Christmas Illustration for use in a Christmas Card, Xmas Animation, Flyer, Poster, Banner, etc. All text is editable and uses a Free font (link in help file)! 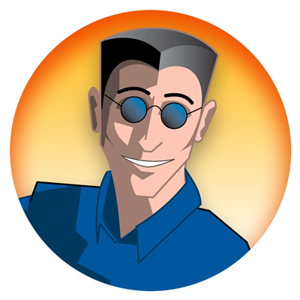 The Illustrator files are fully editable and the Photoshop files are in Super High resolution. All Photoshop files are made with vector smart objects that you can scale as you need without loosing quality! Santa Claus, Snowman or Xmas Tree! So, in reality, you get 9 banners x 3 character = 27 different banners!!! They are very easy to customize to your needs, with ALL text editable, Smart Objects, and well named and organized layers. Each banner with 3 optional characters: Santa Claus, Snowman and Xmas Tree! Halloween is almost here!!! 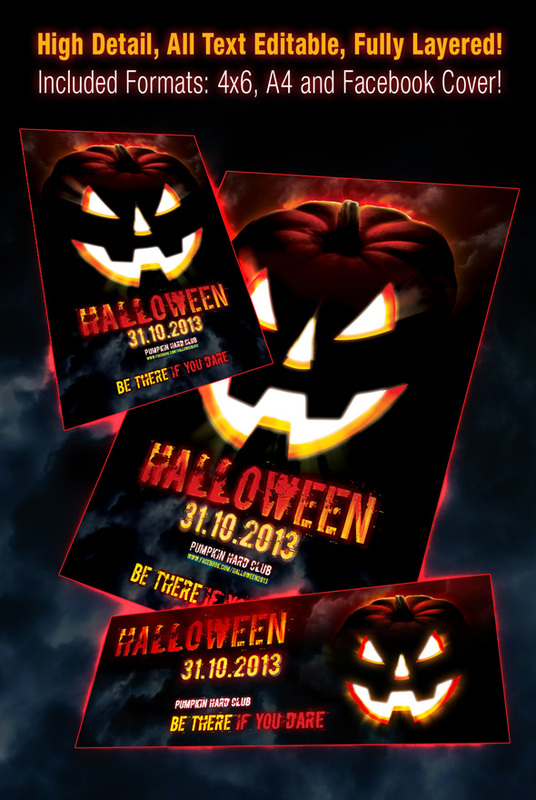 Celebrate it with a fun Halloween Flyer! 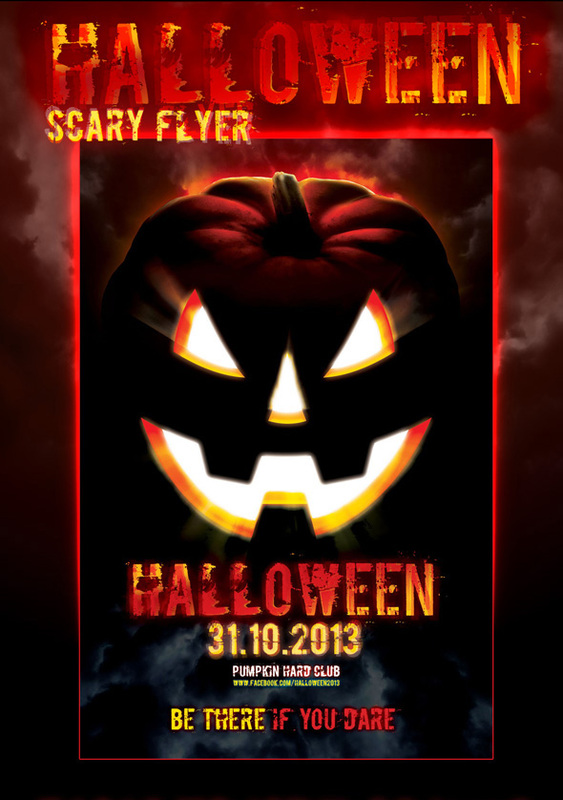 This is a professional designed Halloween Scary Flyer, that will look amazing in any Halloween Event, Costume Party, Nightclub Event, Concert, Gig, Show, Karaoke, etc. It comes in full resolution 300 dpi, in 4×6 and A4 format, plus bleed. And also included is a Facebook Cover for you to easily promote your event! The Photoshop file is fully editable with easy named layers, so you can edit and customize it to your needs. ALL text is editable and it uses free fonts. The flyers include ALL the graphic elements you see – what you see is what you get!!! Remember those days of School?… Great times, Heh? This flyer is an Homage to those great days! 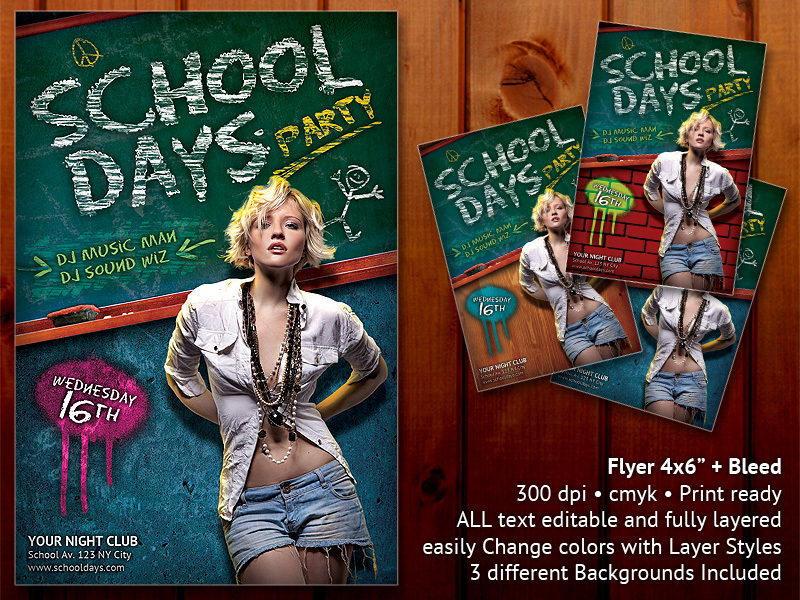 This is a professional designed School Days Party Flyer, that will look amazing in any Back to School Event, After School Party, Nightclub School Event, Student Concert, Student Gig, School Show, Karaoke, etc. It comes in full resolution 300 dpi cmyk, in 4×6 inches format, plus bleed. The Photoshop file is fully editable with easy named layers, so you can edit and customize it to your needs. ALL text is editable and it uses free fonts. The decorative elements are vector smart objects that you can scale freely. This flyer comes with 3 different versions: Concrete, Wood & Bricks! And you can easily change the colors with layer styles – The combinations are endless! The flyers include ALL the graphic elements you see above except for the model photo. The Savannah King – Hotel & Resort Logo! This is a professional Designed Logo, great for a Luxury Hotel, Vacation Resort, Turism Company, Holiday Industry, etc. 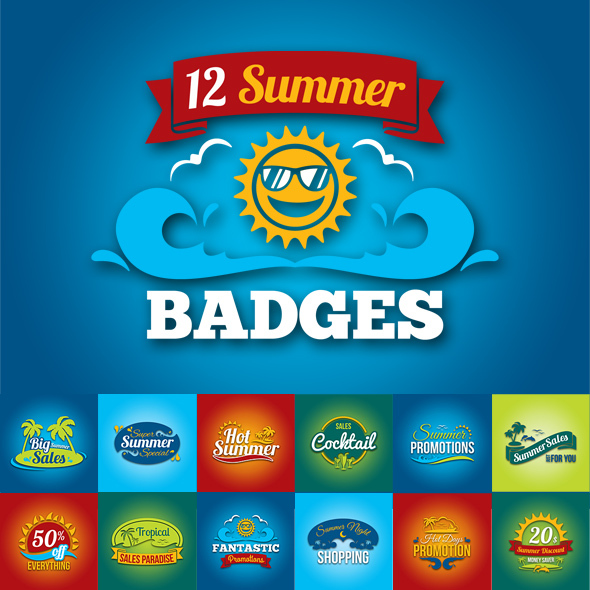 Easily layered, in full resolution print ready, vector and image version included – 100% vector designed and fully scalable on Photoshop and Illustrator. All text editable and very easy to customize! – Just create a layer color style on Photoshop or change the color swatch on Illustrator. My newest item on Graphicriver is a pofessional Designed Logo inspired by Windows™ Metro Graphic Style and User Interface. This is great for a Software Company, Application Developer, Information Technology Company, etc. Easily layered, in full resolution print ready, vector and image version included – 100% vector designed and fully scalable on Photoshop and Illustrator. All text editable and very easy to customize!